Red Pepper directors and editors appear before Buganda Road court on Tuesday morning. Photo by Badru Afunadula. KAMPALA – The Buganda Road Chief Magistrate James Eremye Mawanda on Tuesday morning remanded the five directors and three editors of the Red Pepper Publication Ltd, arrested two weeks ago. Mr Eremye said he needed time to peruse and submissions and review documents in order to make a ruling on the bail application by the incarcerated journalists, after the prosecution led by Mr AbdulSalam Waiswa made objections to their bail application on account that they had been charged with a serious offence of publishing information prejudicial to the national security, among other objections. State prosecutor Waiswa said the journalists would likely continue offending and endangering national security. The prosecution also alleged in their submission opposing the bail application that the journalists would access their communication gadgets and interfere with the investigations. The accused’ lawyers led by Mr Max Mutabingwa and Geoffrey Kandeebe had put up a spirited fight for the release of the 8 journalists, reasoning that the State had shut down their newspaper and confiscated all their computers and communication gadgets, reasoning that it was an assumption on part of the prosecution to submit that they would interfere with the investigations. Mr Mutabingwa, also tried to secure “interim bail” for the journalists who have been in jail for 15 days now, but Mr Eremye said; “that’s my adjournment. The matter will come up again on December 19, when I will make a ruling,” he said amid murmurs from the packed court room. Mr Waiswa expressed the State’s fears that if released on bail, the suspects are likely to frustrate the investigations because once they have access to their computers, e-mails and mobile phones, there is a likelihood of re-connecting with their networks to frustrate the ongoing investigations. Buhweju MP Francis Mwijukye who was at court to follow the proceedings said the matter needed to be taken up aggressively by the media fraternity because it was now apparently bigger than the Red Pepper. “This is an attack on media freedom by the state. The media needs to show more solidarity in having the matter concluded,” he said. Last week the directors and the editors were charged with seven counts – in relation to publication of information prejudicial to national security; criminal libel; and offensive communication. Court started to hear their application last week when they appeared for the first time still in court. Their lawyers MaxMutabingwa, Geoffrey Kandeebe and Dennis Nyombi, applied for bail. But the directors and the editors were sent to Luzira Prison, until tomorrow when the court will give a ruling on the application after prosecution made objections. Two weeks ago, the directors of the local tabloid and the editors were detained at Nalufenya Police station, after Police cordoned off their head offices as crime of scene at Namanve, Mukono Municipality. up to now the premises are still closed. Those detained are Richard Tusiime, the Managing Director; Rugyendo Arinaitwe, the Editorial Director; Francis Tumusiime, the general manager; Johnson Musinguzi, the Chief Finance Officer and Patrick Mugumya, the Chief Operations officer and James Mujuni, the Chief Commercial Officer. The state accuses them of publishing article on November 20 2017, pointing at President Yoweri Museveni, his brother Gen. Salim Saleh and security minister Lt. Gen. Tumukunde for plotting to throw the government of President Kagame. This according to charge sheet, the information injured the reputation of the President and Gen. Saleh. 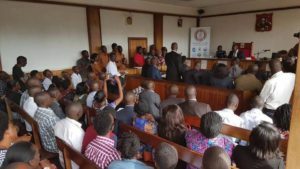 The court room was filled to capacity as the Red Pepper directors and editors appeared for the hearing of their bail application. Photo by Badru Afunadula. Their sureties are Richard Muhangi, Edwin Muzahura, Obed Akiriho, AlexB.Atuhaire and Giles Muhame, among others. Since last week , Red Pepper and other products published by the same media house have not on the market today. The radio station, Juice FM and the online publication were also shut down. “The RedPepper offices are scene of crime and it has been cordoned off, to facilitate these investigations and remain as long as it’s necessary,” said Emilian Kayima, the Police spokesperson.